One of life’s necessities for a rabbit is to spend an inordinate amount of his time chewing. Chewing is normal behavior in rabbits, but there are reasons why a rabbit may suddenly seem to want to nosh excessively on everything in your home. Having a discussion about your rabbit’s diet and lifestyle with your veterinarian can help to pinpoint an explanation and reveal solutions to restore peace between your companion and your household belongings. A rabbit’s teeth grow continuously throughout his life. Chewing counteracts the teeth from overgrowing by wearing them back down. In the wild, rabbits chew grasses and other plant material to achieve this balance. 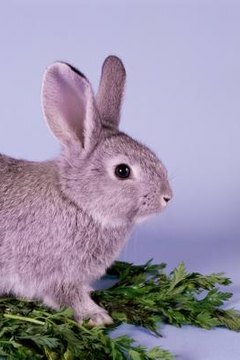 Rabbits must chew on fibrous plant material to maintain dental health and healthy gastrointestinal function. If your rabbit’s diet consists primarily of commercial rabbit pellets, he is not getting the same opportunities to chew as a pet rabbit whose diet consists primarily of timothy hay. This may lead your rabbit to seek inappropriate objects to chew, such as your wooden or wicker furniture or, worse, electrical cords. Discuss your rabbit’s diet with your veterinarian. She may determine that you need to incorporate more grass hays and fibrous vegetables in your rabbit’s buffet menu. Some rabbits chew out of boredom or to gain attention. A caged rabbit may take to chewing on the metal bars of the enclosure, which can damage his teeth. Your only rabbit may be lonely, in which case you may contemplate adding another rabbit for a companion. Discuss your rabbit’s housing environment with your veterinarian to determine if the reasons for excessive chewing are psychological. To minimize boredom chewing, provide your rabbit with plenty of chew toys, which should include blocks of untreated wood or natural wicker, to satiate his biological need to chew and to keep him happy and entertained. Younger rabbits have bountiful levels of energy, prompting them to explore every unchartered nook and cranny in your home, chewing as they investigate. Rabbits have a burrowing instinct. Wild rabbits chew grasses to clear their way when tunneling to create a burrow. Pet rabbits may chew on carpets, wallpaper, blankets, throws and other household items in an attempt to burrow. Female rabbits have a stronger burrowing instinct than males. If your rabbit is not spayed or neutered, talk to your veterinarian about carrying out this procedure. Once a rabbit is spayed or neutered, the inappropriate chewing will decrease over time as the critter matures. Rabbits should never be kept in a cage at all times. They need exercise and mental stimulation. In order to provide this without endangering your rabbit or your home, take the time to bunny-proof the house and furniture in the room to which your rabbit will have access. Cover all electrical cords, remove toxic plants and block access to furniture. Any baskets, linens, statuary or other items that you do not want chewed should be relegated to a room where your rabbit will not be entering. When you see your rabbit chewing on something inappropriate, slide your hand between the object and the rabbit’s mouth and issue a stern verbal reprimand. For positive reinforcement, offer him one of his approved chew toys to nibble on instead.